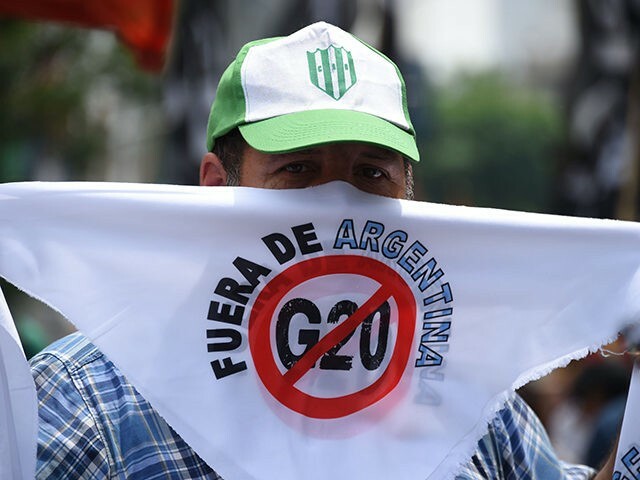 Argentinian Security Minister Patricia Bullrich said Friday that authorities found several “gasoline bombs” near the site where protesters are gathering to demonstrate against the G20 Summit in Buenos Aires. Police found e homemade explosives devices put together with plastic bottles and cloth wicks inside an abandoned vehicle described as a taxi cab. Officials say the protest site is around six miles from the summit’s main venue, the Associated Press reported. Leaders from the world’s leading economies were invited to the summit to discuss development, infrastructure, and investment. As the gathering officially kicks off Friday, those themes seem like afterthoughts, overshadowed by contentious matters from the U.S.-China trade dispute to the conflict over Ukraine. Also expected to loom large are tensions between longtime allies the United States and Europe, the slaying of a dissident Saudi journalist and how the Saudi crown prince who is alleged to have ordered the killing is received by world leaders. The U.S., Canada, and Mexico signed a trade deal — the United States–Mexico–Canada Agreement — replacing the North American Free Trade Agreement that was struck following months of tough negotiations.